Imogen's Typewriter. 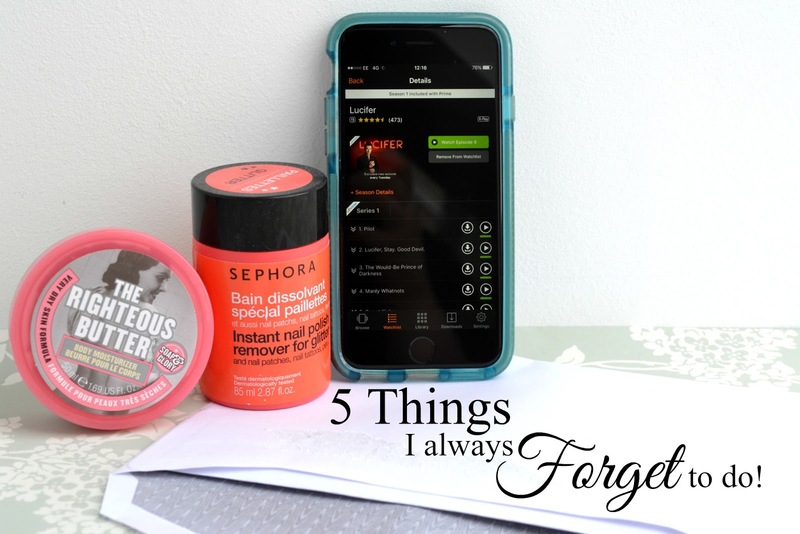 : 5 Things I Always Forget to Do! I can't be the only one that forgets to buy things that everyone needs. I've gone months without having nail polish remover before because I never remember to buy it. Meanwhile, I have a gazillion nail polishes in every colour under the sun that I can't use because I can't remove them! In the age of direct debit, it's pretty easy to let companies take your money and sometimes- there are mistakes. My phone bill had been a couple of quid over each month for about half a year before I picked up on it! Awful! This is my public apology to my friends, people who tweet me and email me, basically anyone who tries to communicate with me that isn't Skype or phone calls- I am really bad at messaging. I generally go for weeks as a chatty cat then I'm incognito for months. If I'm not actively in a quick back-and-forth conversation then I get distracted. I'm working on it! I'm fanatical when it comes to moisturising my face but my body is a completely different matter. It just takes so long and I can never find lotion and it just feels so sticky if you put too much on. Such a first world problem, I know. I'm a marathon girl- not the running type, don't be ridiculous- but when it comes to watching TV shows I tend to get into a show when it's long over or near the end so I can marathon through the seasons in time for a finale. But there are some really good shows actually on TV right now; Lucifer, The Walking Dead, Brooklyn Nine-Nine and even though I love them I somehow manage to get a couple episodes behind before I watch them. I'm a networks worst nightmare. What do you always forget to do?